A dad and his son were attacked with a claw hammer and axe by criminals who targeted their home to steal valuable jewellery. James Varey, 86, was struck with a claw hammer as one of the attackers threatened to cut his hand off unless he handed over rings from his fingers. Son Francis, 51, was hit with an axe as the masked men took a gold chain worth £8,000 from around his neck. The gang also stole a handbag which belonged to Mr Varey senior's late wife Jane, containing 300 sentimental family photographs. The bag was dumped in the snow a few hundred yards from their home in Tingley, Leeds, destroying most of the photographs. Today Gary O'Neil, Terence Honey and Paul Cameron were locked up for more than 40 years over the incident, which happened on January 20 this year. Leeds Crown Court heard the three men were caught hours later when their getaway car crashed into the wall of a house on Flaxton Gardens, Beeston, during a police chase. Some of the jewellery from the raid was still in the vehicle. Medical staff found O'Neil in possession of one of the rings when he was treated in hospital. A court heard O'Neil and Honey were also responsible for a robbery at the Kasa off-licence, Dewsbury Road, Beeston, on the morning of December 17 last year. The pair and another unidentified man entered the store just before 7.30am carrying weapons including a sledge hammer, a wrench and a knife. A female member of staff was threatened before being ordered to hand over £1,700 from a safe and a till. Cigarettes and bottles of alcohol were also taken. The victim had a knife blade held against her leg at the time. O'Neil and Honey were identified from CCTV footage of them going into the store three hours before the robbery and buying items. Mehran Nassiri, prosecuting, said the footage was evidence of the offence being planned in advance and was timed to take place before cash was taken to the bank. Gary O'Neil, 39 of Stratford Street, Beeston, was found guilty of aggravated burglary after a trial. He pleaded guilty to robbery. O'Neil was jailed for 15-and-a half years. Terence Honey, 32, of no fixed address pleaded guilty to aggravated burglary and robbery. He also admitting to an offence of possession of a mobile phone in prison. 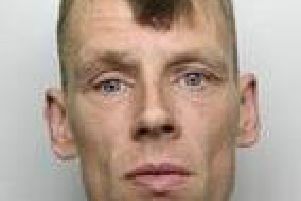 Officers at Armley jail found him with the device in his cell in April. Honey was jailed for 14 years and three months. Cameron, 38, of no fixed address, pleaded guilty to aggravated burglary and was jailed for ten years, 11 months. Police described the three attackers as "utterly lawless individuals" who had no respect for innocent people. Lawyers for the men described how the offences were committed to pay for drugs. Sentencing the defendants, Judge Robin Mairs said: "All three of you are repeat offenders - experienced criminals. "It is quite clear from the evidence that all three of you knew who was present (at the Varey's home) and what you were looking for. "You knew the vulnerability of certainly one of the occupants." After the case, Det Insp Al Burns, of Leeds District Crime Team, said: “These three men put the victims in these incidents through absolutely terrifying ordeals which have had a lasting traumatic impact on them. “They have shown themselves to be utterly lawless individuals who have absolutely no consideration for the innocent people they have offended against and put in danger as they tried to escape from officers. “We hope the significant sentences they have received will provide some level of comfort to their victims and help to reassure the wider community. “Information provided by the community played a vital role in bringing these men to justice and I would like to commend all those who supported our investigation in this way.